Archetypes are living energies which can be found in everything. Archetypes are continually working out in our lives, individually and jointly, corporately and universally, whether we are aware of it or not! As human beings, these energies work through us as a magnetic influence, attracting into our outer personal worlds aspects or energies /archetypes which are weak within us. For example, if you have a bothersome person in your life it is because there is an archetype which needs balancing or strengthening within you. The bothersome person represents the aspect of that particular archetype, and he or she has entered your personal world in order that you will be forced to deal with the archetypal energy they represent within you. In being forced to deal with this person (or your attitude towards them) in your outer world, you are readjusting and realigning the energy of the archetype which that person represents within you. Once the archetypal energy within you has strengthened sufficiently and balanced within you, that person will either leave your life, or cease to bother you anymore – you may even become friends. Weak archetypes within us may also attract illness, and repetitive cycles or unsatisfactory situations in our lives. The balancing of their energies removes or reduces the obstacles we would face in the physical realm. Healing on many levels can be sought. Difficult relationships with others can be more easily understood and improved. Asking questions improves our understanding of the function of archetypes in our lives; therefore we understand ourselves better. Archetypal balancing quickens our evolutionary process. Archetypal balancing results in the activation of Kundalini energy. The following exercises offer deeper insights into Tarot cards – many people think of Tarot solely as a tool for divination, but they are much more than that. The archetypes of the Major Arcana are aspects of Divine Will. Since one of the best ways of exploring archetypes is with the aid of the 22 Keys of the Tarot, one of the first and simplest exercises to enable the attunement to ther Tarot archetypes is to pick a card and carry it around for a few days, perhaps from the First Quarter to the Full Moon, or place it in a room in which you spend a lot of time. During this time, try to become aware of that archetype and its correspondences, and see if you notice any influences occuring in your life which would relate to that particular archetype. You can even put it beneath you pillow before you sleep, and take note of any dreams during this period. 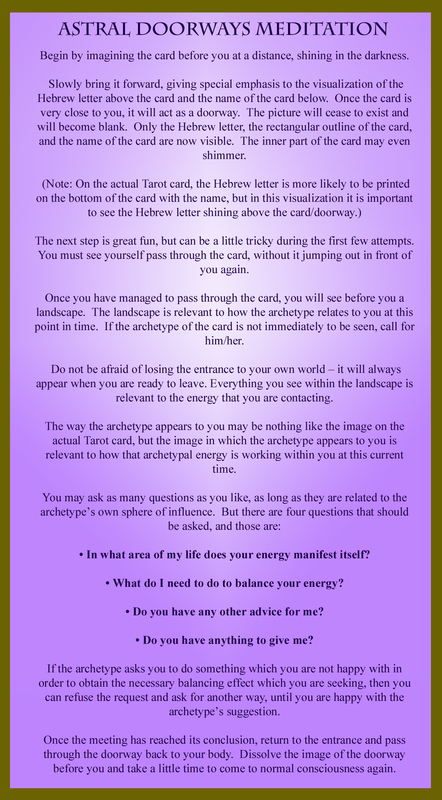 Visualizing the Tarot trumps as doorways is a fun and safe way to meet with the archetypes. Using this method, the energy of the archetype is spread out throughout the landscape diffusing the strength of the figure before you, providing a stable and safe environment in which to interact with the archetypes. Record the meditation as soon as you can, as the memory of it tends to fade as if you’ve woken from a dream. It is advisable to start meeting with The Fool and The Sun archetypes, as they are generally considered to be love energies, and can be helpful in initiating you into this area of meditation work. This method of meditation is safe to use but it is worth noting that you should not jump through the doorway without first looking at the landscape before you because as already mentioned, the landscape is part of the energy which is being explored. It is also worth noting that it’s best only to work with one archetype at a time, at this early stage, i.e., one a day. Over a period of time, you’ll be surprised at how much information you have gleaned using this simple meditation technique. Once you have passed through the 22 Tarot Keys (Major Arcana) with this system, you will have gained a good understanding of how these energies work in you.